Giving Tuesday provides us with a critically important snapshot of the value we provide to our client partners on a strategic and tactical level. 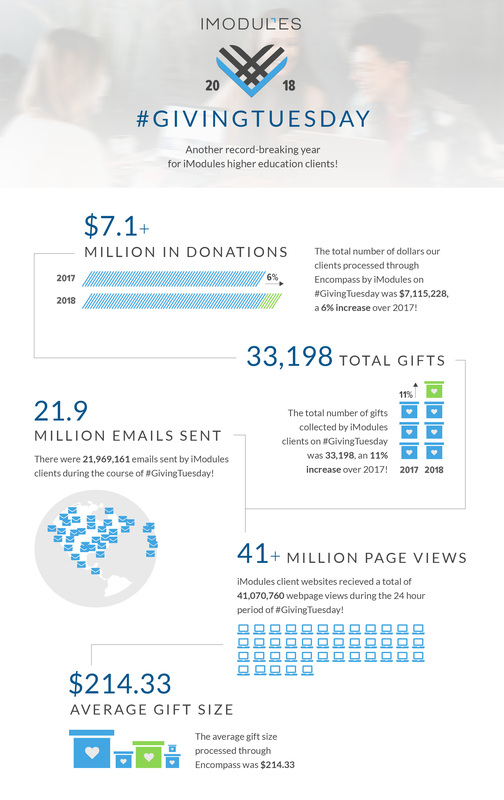 iModules, the leader in higher education fundraising and engagement, announced its clients had another record-breaking #GivingTuesday, raising more than $7.1 million in online donations, a 6 percent increase over 2017. iModules Encompass platform processed 33,198 transactions throughout the day, an 11 percent year-over-year increase, with an average gift size of $214. This year marks the first time the company’s Scoreboards feature was available for #GivingTuesday. Scoreboards from iModules drives gift dollars, alumni memberships, and event participation through visual features like maps, leaderboards, donor rolls, affiliation pictorial, and social web to understand a donor’s impact within their social networks. For more details about the #GivingTuesday movement, visit the #GivingTuesday website (http://www.givingtuesday.org), Facebook page (https://www.facebook.com/GivingTuesday) or follow @GivingTues and the #GivingTuesday hashtag on social media. This analysis includes all U.S. clients that collected donations using iModules technology between 12:00 a.m. and 11:59 p.m. CST on November 27, 2018.